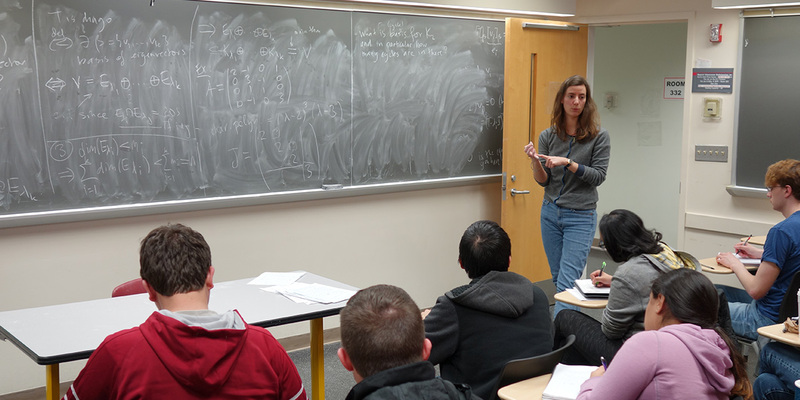 The Mathematics Department undertakes internationally-recognized research in all areas of pure and applied mathematics and mathematics education and provides quality instruction for an annual undergraduate enrollment of approximately twenty-four thousand, as well as five hundred majors in three different curriculum codes*. Consistently ranked among the top twenty-five programs in the country, the Department counts over forty Fellows of the American Mathematical Society or Society for Industrial and Applied Mathematics, three members of the National Academy as well as a winners of national and university-wide teaching prizes. Approximately sixty tenure-track faculty hold lines entirely within the department or share appointments with computer science, physics, engineering, and education. Together with thirty teaching-focused faculty the department educates students from all Schools at Rutgers as well as high-school students and teachers from around the State of New Jersey. * Curriculum Codes: Mathematics 640, Biomathematics 122, and Statistics/Mathematics 961.